We are pleased to have been selected among local charities to receive proceeds from Hall Winery’s 3rd Annual Cabernet Cookoff! From the generous team at Hall Winery and Foxtail Catering: Join us this Saturday for an afternoon celebrating and promoting Napa Valley nonprofit charities. 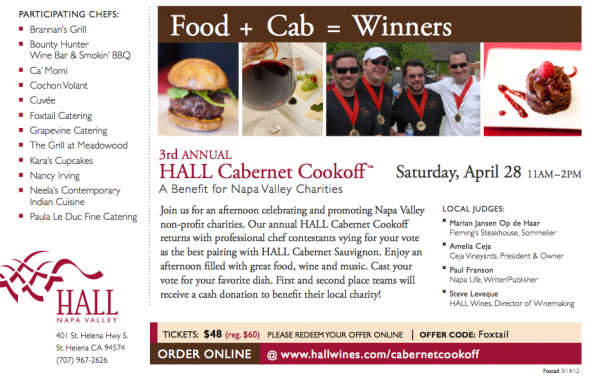 Our annual HALL Cabernet Cookoff returns with professional chef contestants vying for your vote as the best pairing with HALL Cabernet Sauvignon. Enjoy an afternoon filled with great food, wine and music. Cast your vote for your favorite dish. First and second place teams will receive a cash donation to benefit their local charity! We are hoping 826 Valencia can help support Foxtail Catering. Tickets for 826 Valencia volunteers and friends are 20% off (regularly $60, $48 for you). Please visit http://www.hallwines.com/cabernetcookoff for more information and to purchase your tickets and enter the promotion code for 826 Valencia: “Foxtail”. If you have any questions, please email Lauren Hall, 826 Programs Director.